“The powerful response to the cover shows that environmental issues resonate strongly in Australia and this isn’t surprising when one considers that nearly two-thirds of Australians (65%) agree with the statement that ‘At heart I’m an environmentalist’," Rog Morgan CEO Michele Levine says. "That’s over 13 million Australians that are a potential market for magazines focused on leading environmental issues." The Australian Geographic, National Geographic Sydney-owned antipodean edition, has grown substantially over recent years too. In the twelve months prior to June 2018, the magazine was read by 568,000. The magazine has achieved a largely consistent readership of over 550,000 over the last two years. As a nation, Australia considers oceans and coastal environments as key areas of concern. A 2017 report released by the WWF and Roy Morgan showed 81% of participants saying ‘the coast and ocean is central to the Aussie way of life’, while nine out of ten Australians agree that more needs to be done to protect oceans and marine life. According to Australians, plastic and chemical pollution, followed by global warming were the top three threats to the oceans and coastal waters (85%, 71% and 58% respectively). Of the perceived threats to oceans and coastal waters, plastic pollution ranks highest at 85%. Other concerns such as commercial fishing are significantly further down the list at 45%. National Geographic’s Planet or Plastic issue achieved the magazine’s highest ever monthly readership, with more than 1.7 million Australians reading the June 2018 edition. 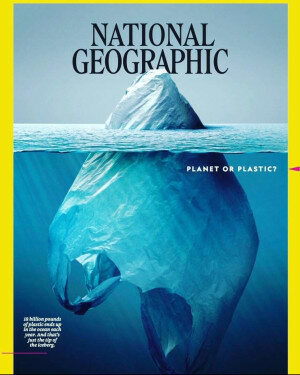 The special issue cover featured a plastic bag in the shape of an archetypal iceberg with 90% of the ‘stylised’ plastic iceberg submerged beneath the surface of the ocean. The surge in readership comfortably surpassed previous records, including the 125th Anniversary Collector’s issue released in October 2013. It may be one of the oldest magazines available, first published more than 130 years ago, the magazine has found that young Australians are the core of their readership, which averages at more than one million a month. Over half of the Australian readers of the National Geographic are either millennials (27.5%) who are now aged largely in their 30s or Generation Z (24%) who are now teenagers or aged in their 20s. Comparatively there were fractionally less Generation X’ers (18.4%) than Baby Boomers (19.5%) who read National Geographic. Only 10.7% of readers are categorized as Pre-Boomers, born before 1946. The Australian Magazine Awards celebrate the very best in publishing. Check out more about the event here.